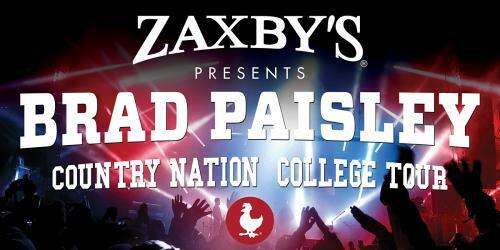 Following Brad Paisley’s highly successful free concerts at four major universities drawing more than 65,000 fans, he and IMG today announced five additional dates to bring the Country Nation College Tour presented by Zaxby’s to IMG College partner schools. The tour coincides with the radio launch of Paisley’s song, “Country Nation,” which celebrated its official airplay impact date on Monday as this week’s most-added new single at country radio. The music video for “Country Nation” debuted last week. The song’s celebration of the blue-collar spirit and our nation’s love for sports colorfully come to life, in part through the appearance of more than two dozen college football team mascots. The full video can be viewed now at http://smarturl.it/BPCountryNationVideo. Brad Paisley is a critically acclaimed singer, songwriter, guitarist and entertainer whose talents have earned him numerous awards, including three GRAMMYs, two American Music Awards, 14 Academy of Country Music Awards and 14 Country Music Association Awards (including Entertainer of the Year), among many others. He has been a proud member of the Grand Ole Opry since 2001. Paisley has written 20 of his 23 #1 singles with the first being his 1999 hit “He Didn’t Have To Be” and his most recent, “Perfect Storm,” from his chart-topping 2014 album Moonshine in the Trunk. Paisley kicked off his Crushin’ It World Tour the middle of May by playing to over 50,000 fans the first weekend and will continue through October. Paisley has partnered with Boot Barn® and developed an exclusive line of jeans, hats, T-shirts, jewelry, belts and woven shirts called Moonshine Spirit by Brad Paisley. Fans can look for him and Carrie Underwood to return as hosts of “Country Music’s Biggest Night™” as “The 49th Annual CMA Awards” airs live from Nashville on Wednesday, Nov. 4 (8:00-11:00 PM/ET) on the ABC Television Network. Connect with Brad at www.BradPaisley.com, www.Facebook.com/BradPaisley, on Twitter @BradPaisley, on Instagram @Brad Paisley, and YouTube at YouTube.com/BradPaisley. EMI Records Nashville breakout country artist, Eric Paslay, delivers a powerful punch as a renowned, Platinum-selling, hit songwriter and dynamic performer. Paslay has celebrated five No. 1 hits including “Even If It Breaks Your Heart” (Eli Young Band), “Barefoot Blue Jean Night” (Jake Owen), “Angel Eyes” (Love & Theft), “Rewind” (Rascal Flatts) and “Friday Night,” the smash lead single from his critically acclaimed self-titled debut album. The Temple, Texas native earned nominations for GRAMMY Best Country Song, ACM Song of the Year and CMA Song Of The Year for “Even If It Breaks Your Heart.” A true artist’s artist, USA Today calls Paslay “flat out-brilliant” and American Songwriter names him an influencer of country music. Paslay is currently writing and recording for his highly-anticipated sophomore album. Enjoying great chicken in an atmosphere where you could be yourself? That’s what childhood friends Zach McLeroy and Tony Townley wanted to achieve when they founded Zaxby’s back in the 1990s. Many years and locations later, Zaxby’s is still delivering on that promise: to serve delicious chicken fingers, wings, sandwiches and salads in a fun, offbeat atmosphere where we welcome customers as friends. As of August 2015, Zaxby’s has grown to more than 700 locations in 16 states and is headquartered in Athens, Georgia. For more information, visit zaxbys.com or zaxbysfranchising.com.